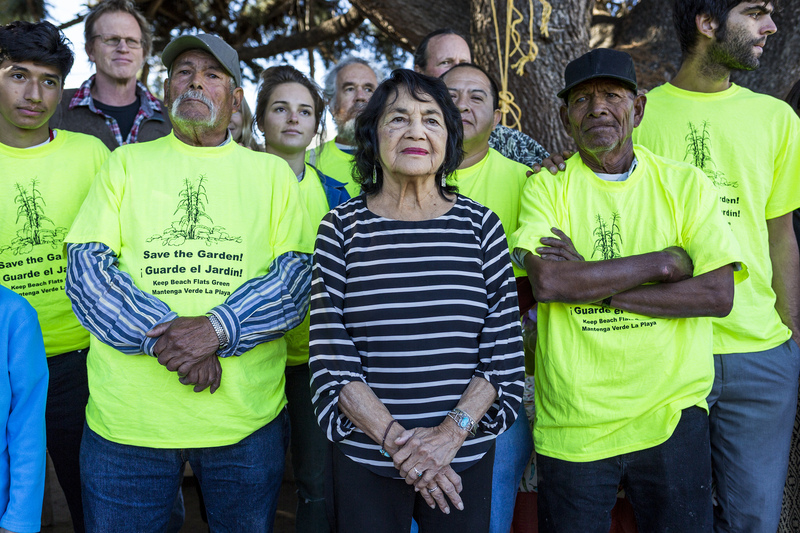 Dolores Huerta stands with gardeners Don Emilio Martinez Castañeda (left) and Domingo Martinez (right) during a garden meeting on Nov. 13. Huerta emphasized the importance of small gardens and gave her support in their continued fight. Photo by Jasper Lyons. 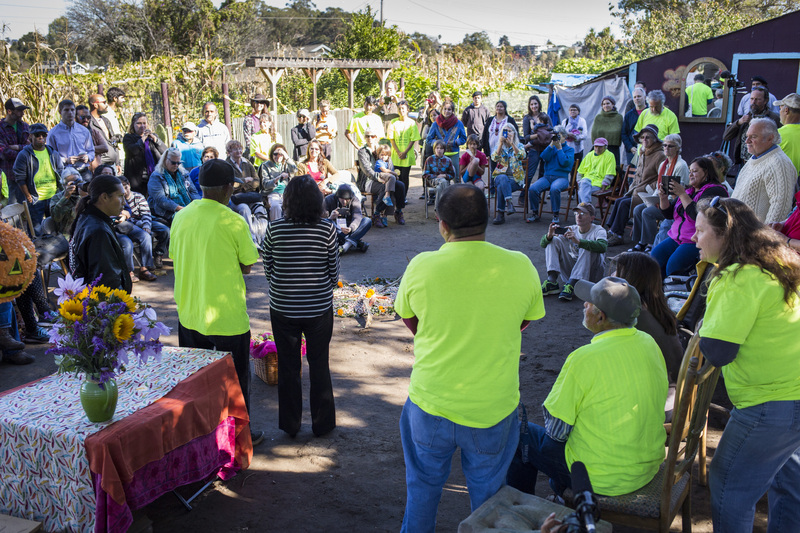 A bittersweet atmosphere hung over Beach Flats on Friday morning as community members gathered to reflect on and celebrate the community garden and mourn the expiration of its 20-year lease. However, this aura began to change as wafts of burning sage drifted over the fences, announcing the arrival of Dolores Huerta. Huerta, 85, is a renowned labor leader, civil rights activist and founding member of the United Farm Workers. She passed through the Beach Flats while in town for a birthday celebration that doubled as a fundraiser for the Dolores Huerta Foundation. Three former mayors, current Mayor Don Lane and Santa Cruz City Council member Micah Posner were among the audience of at least 80 who came out to celebrate and hear Huerta speak. Gardener Domingo Martinez presented Huerta with a key to the garden as well as a basket of fresh vegetables, a t-shirt and a welcoming certificate to the garden. After receiving the gifts, Huerta stressed the importance of small community gardens to the crowd. Her presence was described as “comfortable” by gardener Don Emilio Martinez Castañeda, who reflected on the garden’s beginnings. The Beach Flats garden has been a neighborhood hub and source of local organic food for the community since 1994. Santa Cruz Seaside Company, which owns the Boardwalk and many other surrounding areas, has allowed gardeners and community members to use the garden rent-free since its opening, only asking that the city of Santa Cruz pay the municipal water fees. Seaside Company announced that it will take back the land, using it for its own landscaping purposes starting Nov. 13. 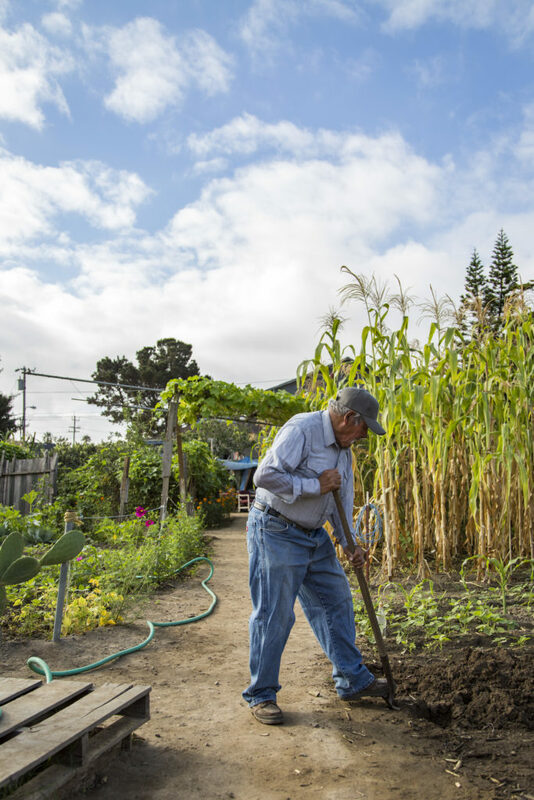 Since September, Santa Cruz City Council has been in negotiations with Seaside to come up with both temporary and long-term solutions to acquire the entire garden permanently. The city has agreed to a 60/40 percent lease, in which 40 percent will return to Seaside Company. Although the city and Seaside have yet to sign the new lease, officials from the Santa Cruz Parks and Recreation Department put up caution tape just before the initial lease was up, separating the community’s land from Seaside Company’s portion. The space will remain closed until January while Santa Cruz Parks and Recreation applies for a temporary use permit and allots the 17 spaces for the gardeners. The planning commission received the application and will review it at its meeting on Dec. 17. The Beach Flats community will have a chance to contest the plan in a 10-day appeal process. Some of the gardeners, including Don Emilio, have said that they are willing to share their plots so that their friends and community members do not have to lose what little garden is left, but sharing plots means crowding crops and less product overall. The community continues to meet on Saturdays at 4 p.m. in the garden, collectively discussing a permanent solution for the space that addresses all concerns.